How would I make an ice cream cupcake??? This question had been floating around in my head for some time and finally the random thought turned into an obsession sparked by an article I read (and misplaced) about updated ice cream bombes in Berkeley. After days of reflection I came up with this recipe. I simply couldn’t wait to see the green cake layered with purple lavender ice cream and creamy honey ice cream. Warning to you… this recipe takes days to make and requires an ice cream machine. The good news is that you can make it significantly easier on yourself by purchasing high quality ice cream and making only the cake and frosting. I highly recommend it! The batches of ice cream specified below make enough for one go in the cuisinart, but not enough to fill all 24 cupcakes. (I only had enough for 16 of them.) And because you need to chill the ice cream maker insert literally overnight for it to work, it would have taken a week to make enough ice cream for the whole lot. So aside from buying the ice cream, you would need to plan well in advance. I haven’t tasted these yet. I am forcing myself to go to work on a Sunday to get caught up, as they say, and am saving one of these little guys as my reward. I will post an update tonight on the end result. Update: These tasted pretty fantastic, but they were very sweet… which I like. The matcha powder I purchased (from Whole Foods for $30 an ounce, yikes) was very strong and I could definitely taste the green tea. The green tea flavor was the strongest initially, with the honey coming in right behind it. I used a stronger, darker honey and the taste was very ‘in your face’. Next time I would use something milder. Interestingly, the lavender came in at the end, not completely overwhelmed by the other strong flavors, making this a relatively complex if cloyingly sweet cupcake experience. 1. Bring creams and lavender flowers to a gentle simmer for about two minutes then take of heat and set aside for 10 minutes. 2. In a bowl, whisk sugar and egg yolks until they are thickened and pale yellow. Whisk in the flour. 3. 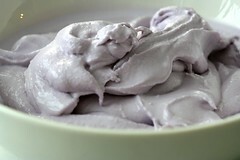 Strain the lavender leaves out of the milk then slowly pour the warm mixture into the eggs while whisking the eggs. 4. Transfer everything back into the pan and gently heat, stirring with a wooden spoon constantly until thickened. Add salt and food coloring and stir to combine. 5. Strain into a bowl and let cool slightly. Cover and refrigerate at least 2 hours or overnight. 6. 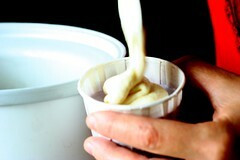 Make the ice cream in your ice cream machine per the manufacturer’s directions. 1. In a bowl, whisk honey and egg yolks until they are thickened and pale yellow. Whisk in the flour. 2. Bring creams to a gentle simmer pour then slowly pour the warm mixture into the eggs while whisking the eggs. 3. Transfer everything back into the pan and gently heat, stirring with a wooden spoon constantly until thickened. Add salt and stir to combine. 4. Strain into a bowl and let cool slightly. Stir in vanilla. Cover and refrigerate at least 2 hours or overnight. 5. Make the ice cream in your ice cream machine per the manufacturer’s directions. 1. Prepare sheet pan by rubbing with butter, covering with parchment, rubbing with more butter, and dusting with flour. 3. Add sugar. Beat on medium-high until light and fluffy, about 3 minutes. 4. Add eggs/egg yolks one at a time, beat for 30 seconds between each. 5. Whisk together flour, baking powder, and salt in a bowl. Add to batter and mix to combine. 6. Mix matcha in with the milk. Add to the batter and mix until combine. 7. Pour into prepared 1/2 sheet pan and smooth flat. 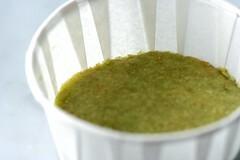 Note: You can use this batter to make straight up green tea cupcakes. 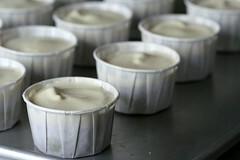 Simply scoop into cupcake papers and bake for about the same amount of time. 1. Cut rounds of cake to fit in the cupcake paper. Put a round in each cupcake paper. 2. Place a scoop of lavender ice cream on top of each round and smooth with the back of a spoon . 3. Place cupcakes in the freezer and chill for 1 hour. 4. Place a scoop of honey ice cream on top of each round and smooth with an offset spatula dipped in hot water. 5. Place cupcakes in the freezer and chill for 1 hour. 6. Smooth a thin layer of buttercream over the cupcakes and top with a decoration. Store in the freezer. Note: I purchased the cute, pink royal icing flowers at a local cake supply store. This was too much work as it is! I will be curious to find out how these taste. A couple weeks ago, we made matcha cupcakes which had a very good strong matcha flavor on the day of baking, but by the next day, the flavor had almost completely vanished. We even made them extra strong by using cold green tea instead of milk in the batter. 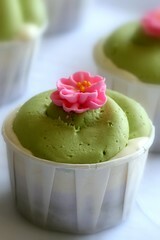 I was so happy to see a green tea cupcake posting at your blog, I made one yesterday. I will try to make another batch using your recipe. Your recipes and pictures look great! Fantasitc! What a great idea. Just wow. What an intriguing combo! 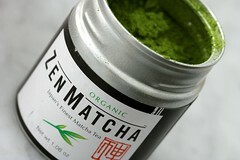 i’m curious where you get your matcha powder from. do you buy it online? Good Lord, these are beautiful! They look so delicious; I am drooling on myself. The colours look fantastic together. Love the nice touch with the pink flower against green frosting. If they taste even half as pretty as they look, you definitely have a winner. Absolutely gorgeous. These are beautiful! I wish I had the budget for the macha. I’ll just have to live vicariously through your descriptions. I made a version of ice cream cupcakes where I just filled the cupcake liners partway with chocolate cake batter, baked them, then filled the liners the rest of the way with mocha ice cream, then some whipped cream, then topped off with grated dark chocolate. They turned out really well, too! Yeah, i’m gonna’ need one of these RIGHT NOW! What a perfect summer cupcake! I’m sure they taste divine! Absolutely divine and so shabby chic looking. Would love to make them for my girlfriends wedding as a dessert but do you know where I could buy cupcake paper pans like yours in Australia. We only have the soft paper and I dont think they would be strong enough. i love your recipes! I often come on to your site to drool at the cakes! I made the peanut butter filled choc ones at the weekend and they were gorgeous!!! I was wondering if its ok to link your blog from mine? i have been praying for a good tried and tested matcha cupcake and you really delivered!!! i’m going to make these on the weekend. Thank you!!!! I have never ever used matcha or seen it really. 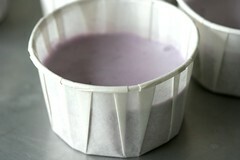 I have made lots of things with lavender and that is exactly how i make my lavender ice cream. oh and i finally got around to updating my blog’s favorite links and I added you. I love the colors! What a fun site you have. Oh My Gawd, those look fantastic! Really incredible. And love the lavender. I’ve been plarying around a little with it too but I’m very new to it. I love eating that fragrance, if you know what I mean. Absolutely beautiful and very original! I make candied flowers from my garden: violets, rose petals, etc., violets are especially appropriate for this inspiring concoction. Every time I stop by your site I’m stunned, simply flabbergasted by the creativity and gorgeousness of your cupcakes. This recipe is no exception. I can just imagine how good they were. Where do we get on the “friends and admirers” list with an invite to stop by and sample? 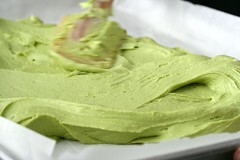 Can’t wait to give the Green Tea Cupcakes a try – I’m pretty much obsessed with both Green Tea and cupcakes of all kinds. Wow! These are my dream cupcakes. Literally, four of my most favorite things in one place! I thought I was being creative with my matcha, rice pudding, cream cheese cupcakes but they don’t even compare to these little dreams! THE FIRST BITE WAS DELICIOUS. BUT AFTER A MINUTE I WANTED TO VOMIT A LITTLE. TOO MUCH SUGALR! THOSE CUPS REMIND ME OF TAKING RITALIN IN ELAMENTREY SCHOOL AT THE NURSES OFFICE~~! OH S! i THINK MY CAKE IS BURNING! The picture of that cupcake is beautifull!! Very eye-catching, that’s what got me interested into this recepie in the first-place.. I like the recepie, though I think the flavors are TOO intense for the regular palete. Instead of matcha cake, I would make it CHOCOLATE!! Cause chocolate tastes wonderfull with Lavender!! Like sugar-plum fairies dancing on my tongue!!! Hello, I’ve tried out your green tea cake recipe as cupcakes and they came out lovely, though I would have to cut down on the sugar. Thrilled to see this idea – they look fantastic. Here’s an idea for anyone out there wanting to try them (though I have not yet). I found matcha at an Asian market for $5.99. Just a thought to save some money in our cupcaking endeavors! 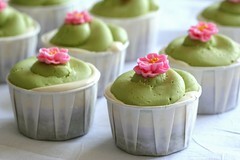 I made the green tea cupcakes, and they were very good! I’ve also found matcha at Japanese markets at decent prices. Thanks for the recipe! What an inspiration! Thanks for sharing this fabulous idea! i just made these as mini cupcakes. no icecream or anything. and they are amazing. so cute with a little vanilla disc on top. i found the matcha at jamaba juice asked the guy for a few tablespoons since i knew i wouldn’t need too much. wonderfun! hey, i made these as regular cupcakes & followed exactly what the directions said to do, but somehow they came out much too crumbly and were not domed at all — just flat cupcakes. i could barely take the paper off without the cupcake crumbling completely. i wonder what went wrong. 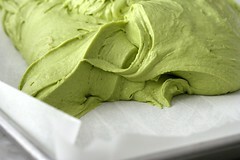 Just curious how you gofrom having a white top to a green, or is that just the icing? It looks like the Macha to me. I’ve never heard of an ice cream cupcake before nor ever seen one. This is the first time. Looks like I should try my hand at this as well – love ice cream! Hi there, I’d love to start trying this recipe. Just a quick question, could i still freeze it after frosting? or can i only frost it right before serving? ahhh! so sorry i didnt read carefully and just realised you actually mentioned we could store it in the freezer. But wouldn’t the buttercream frosting be hardened? I just wanted to post and let you know that I used an altered version of these cupcakes, now posted on my blog Thanks for the inspiration!